A trip to Memorial Mall and look what I found? A parka! 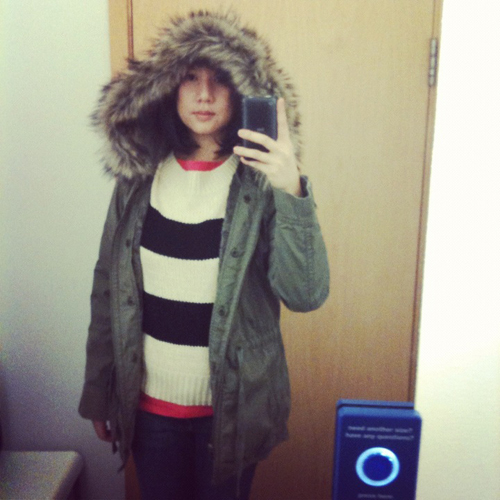 What surprised me was it looked almost like Wendy’s Lookbook Split Tail Parka she had photographed last month. Yes, I had to pose like Wendy with the top on. The Gap parka is so nice, priced at $168 and has a removable sherpa lining. Right now at gap.com, it is marked down to $99.00! However it only comes in Medium size as of right. In stores, there were many sizes. In this picture, I’m wearing a size Small. Hopefully there will be some coupon codes soon and I might pick this parka up. The sweater has the nautical stripes that are still popular this year. The material isn’t as soft as I thought it would be. So I passed and hopefully something better will come around. I love parkas: I bought one by Superdry at the start of last season and have worn it loads. Practical, and very chic at the moment! 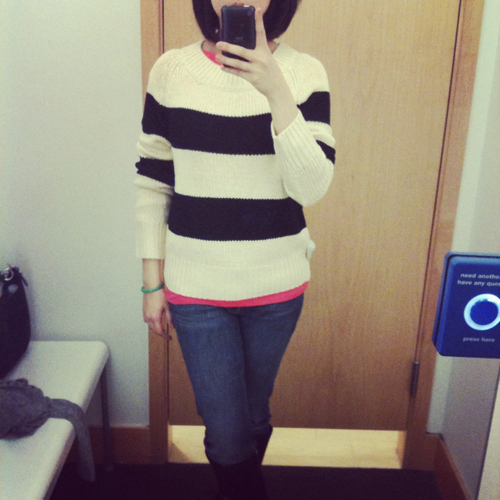 I also saw that sweater on Gap online, for a reduced price. Check out their website, they have a 15% discount on there for first time subscribers. Love that stripe sweater. I am in to stripes these days too!